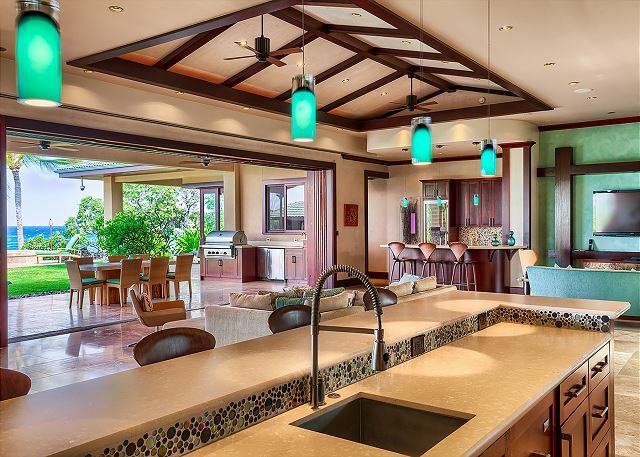 Four Bedroom Oceanfront Estate at Naupaka Place at Waikoloa Beach! 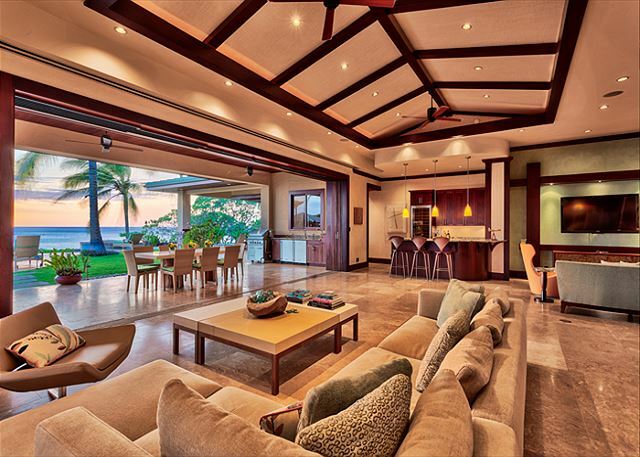 Enjoy this spectacular beachfront home at Naupaka Place at Waikoloa. 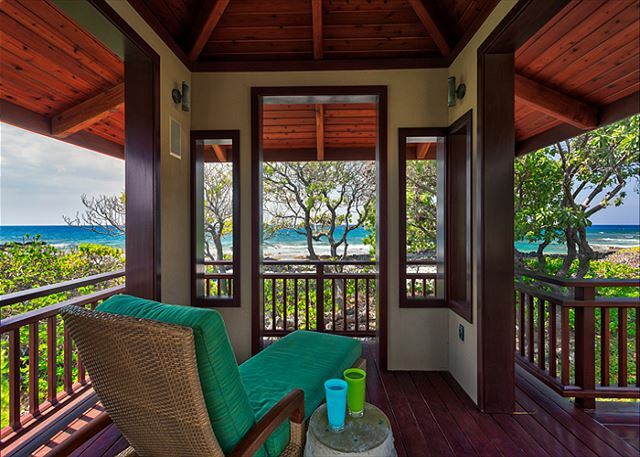 Along with an oceanfront setting enjoy direct access to a trail that leads you to ABay. 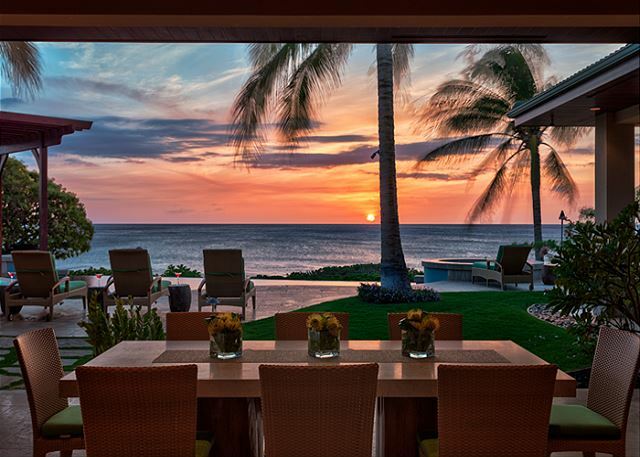 Welcome to Pacific Sunset Villa, home of expansive ocean views and ultimate luxury. 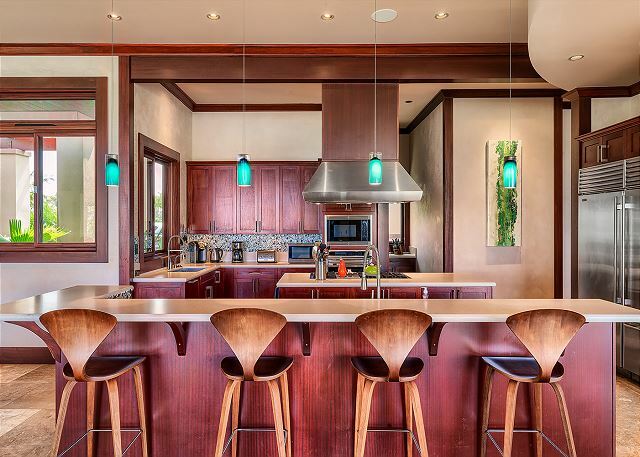 This award winning home with 4 bedroom with ensuite bathrooms and 3 half bathrooms sits on an oceanfront setting and offers easy access to all the amenities at Waikoloa Beach Resort. The spacious great room offers a nice living area with a couch and lounge chair as well as a small entertainment area facing a wall mounted LCD television. 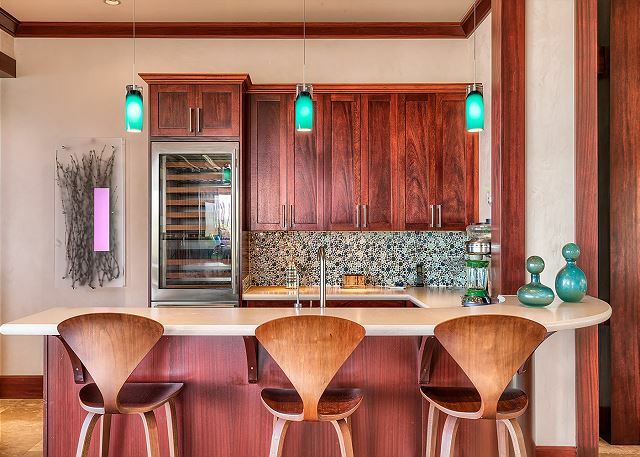 There is a large wet bar with a wine cooler, which is great for entertaining. 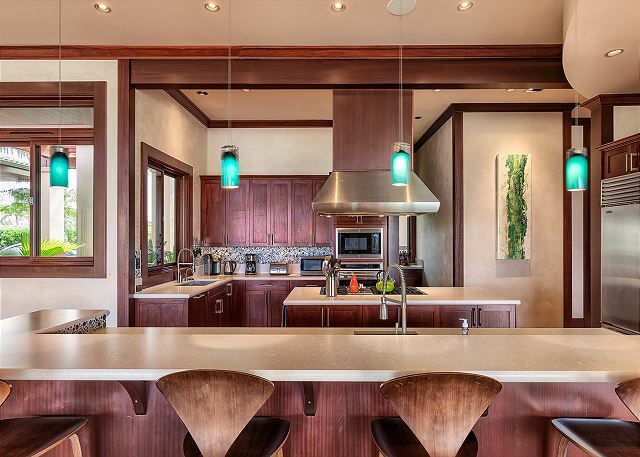 On the other side of the great room is the kitchen with granite counters and stainless steel appliances. 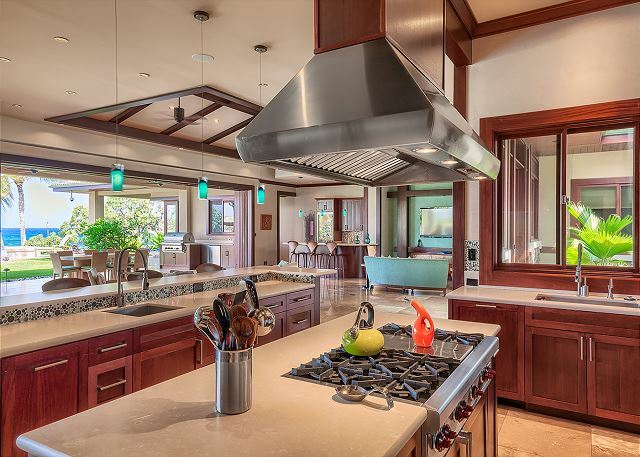 The island features a gas stove with a griddle. Adjacent is the dining area, which seats 8. 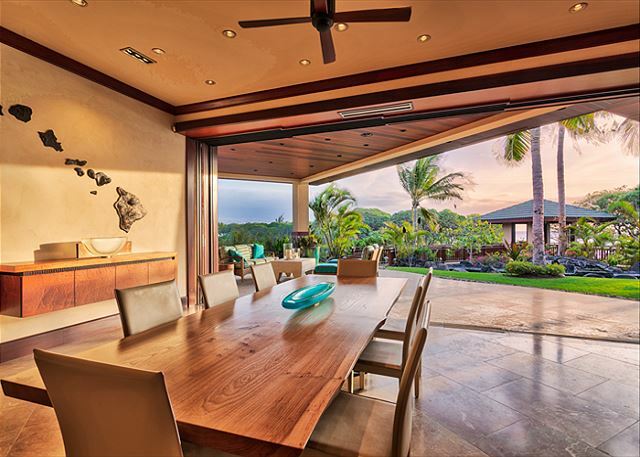 With a click of a button, open the large pocket doors to open this room to the beautiful outdoor setting. 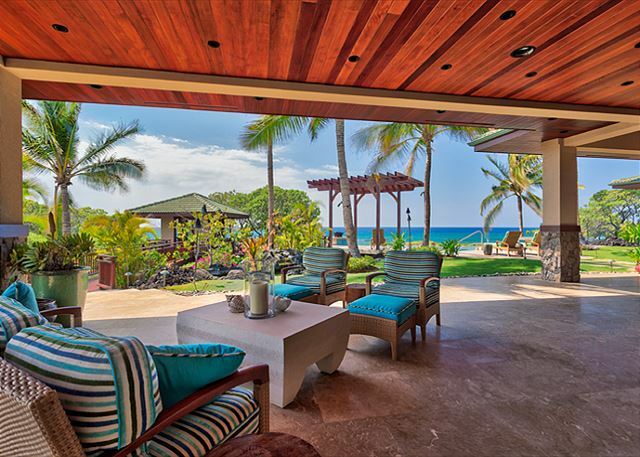 The outdoor area is spectacular on an oceanfront setting. 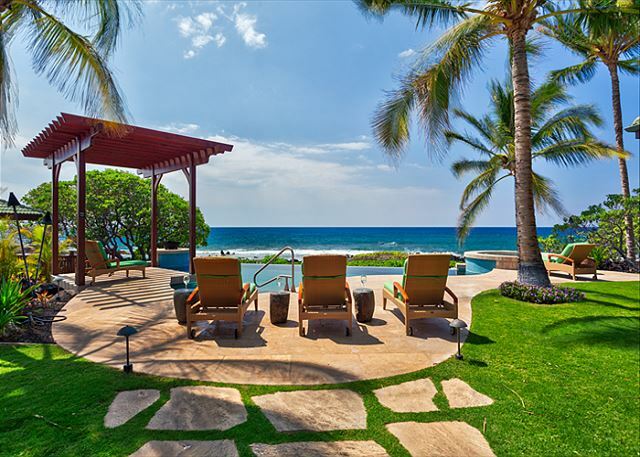 With the surf breaking just off the lanai there is not a better location you can ask for. 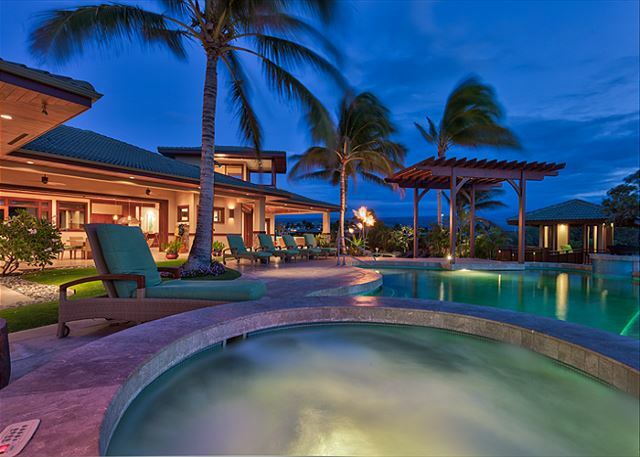 Here you will find an infinity pool as well as a Jacuzzi. Next to the tea house is a koi pond with a waterfall. 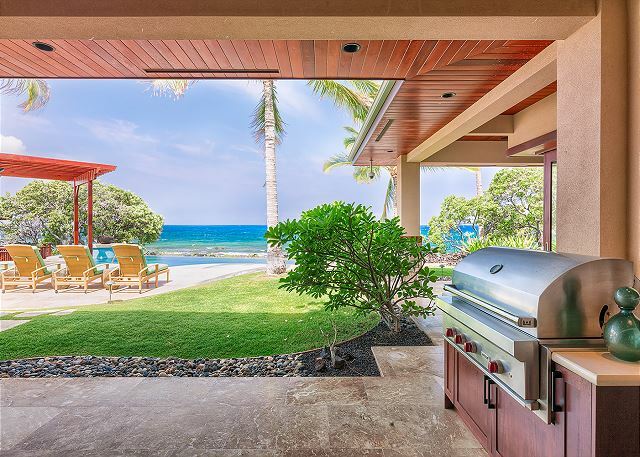 The wraparound lanai has a dining area, which seats eight with a wet bar and stainless steel grill. 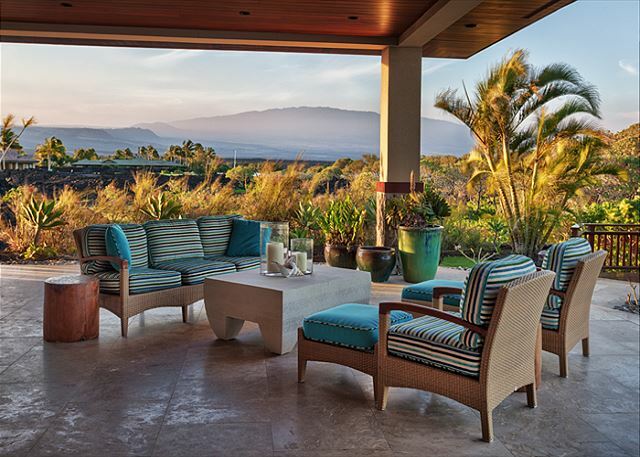 On the other side of the lanai is a dining area with a couch and two chairs. 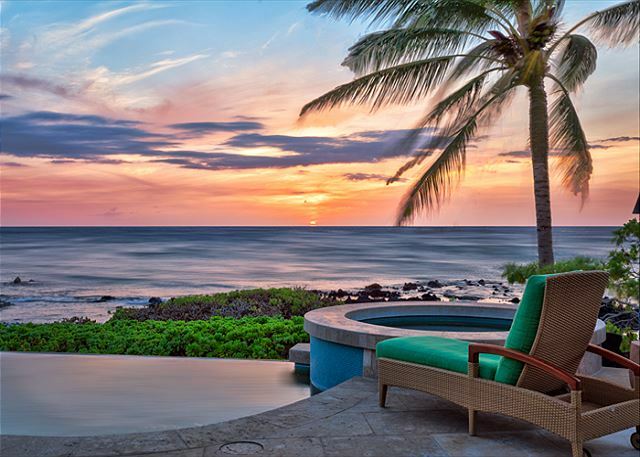 Light the tiki torches to enjoy a beautiful Hawaiian sunset! 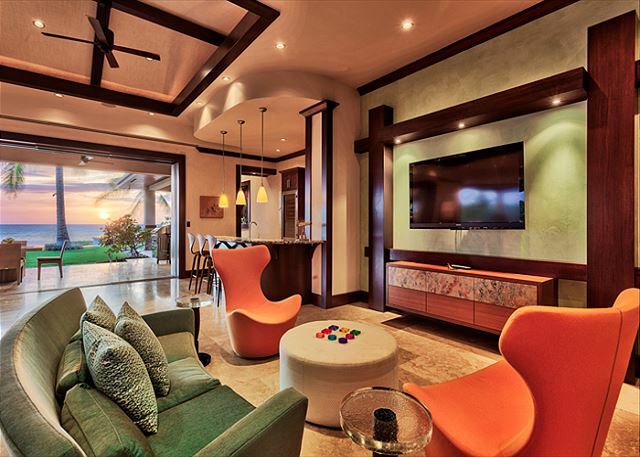 Just off the great room is your own movie theater. The theater features a big screen LCD television with surround sound and a BluRay player. There are six comfortable reclining chairs for seating. 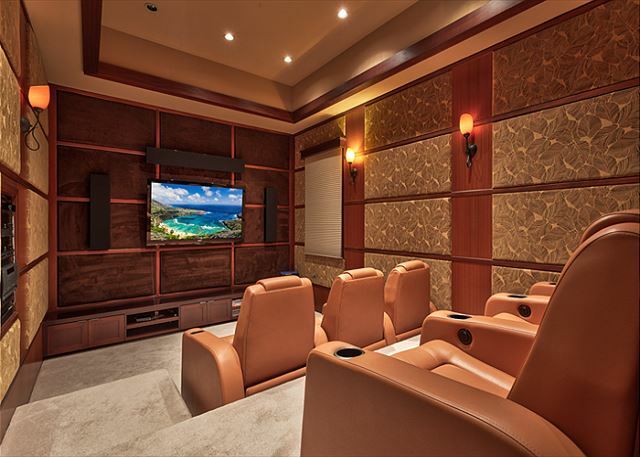 This room was well designed to give you the movie theater feel and is a great place to get away to watch your favorite sporting event or to watch a classic movie. Travel upstairs just off the dining area and enjoy one of the more breathtaking areas of the house. Located up the stairs is a whale watching loft. There is a nice lounging area where you can enjoy expansive ocean views and during the winter months enjoy whale watching. 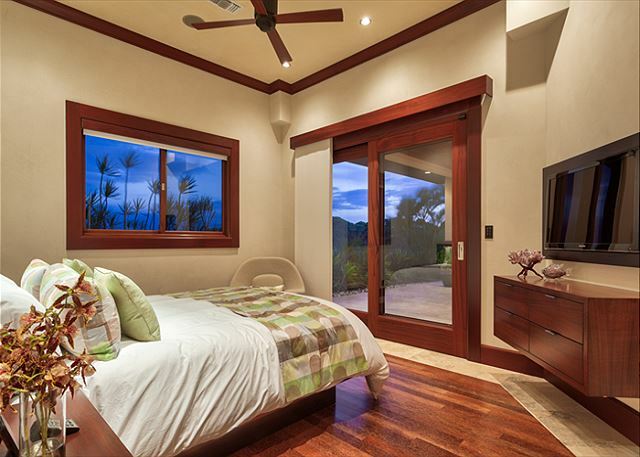 On one side of the home is the master bedroom. 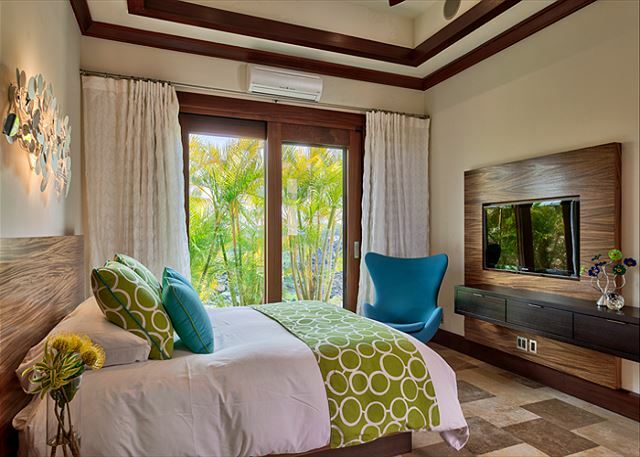 The master bedroom has a king size bed with a television. 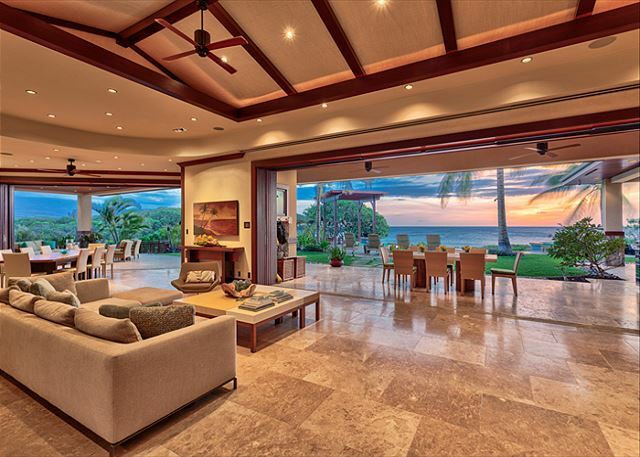 Open the large pocket doors and enjoy the ocean view. 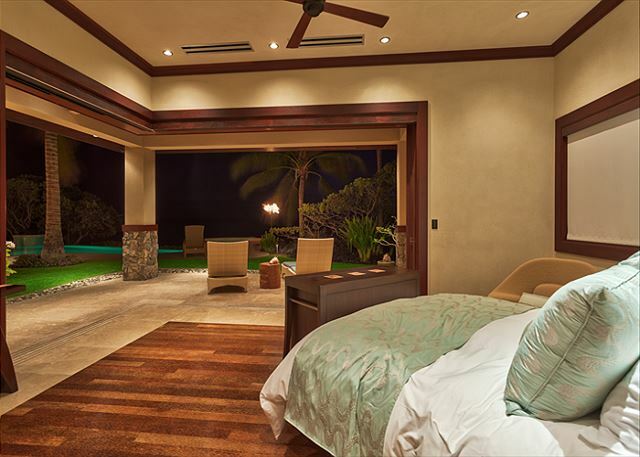 There are also sliding screen doors available so you can leave the doors open throughout the night and hear the sounds of the tropics. 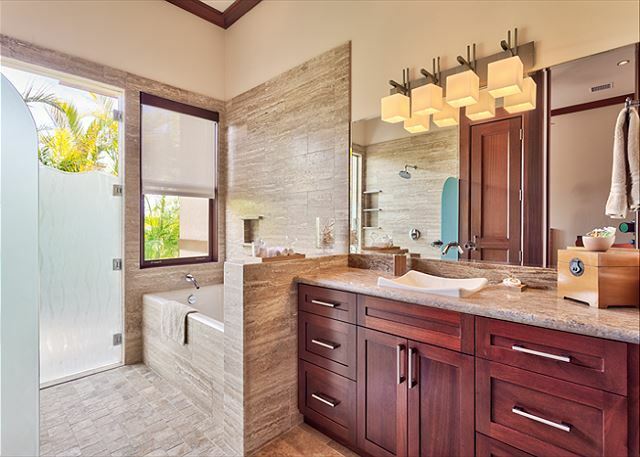 The master bathroom offers dual vanities, a large walk in closet, and a walk in shower. Just outside is the outdoor shower and tub in a nice landscaped area. 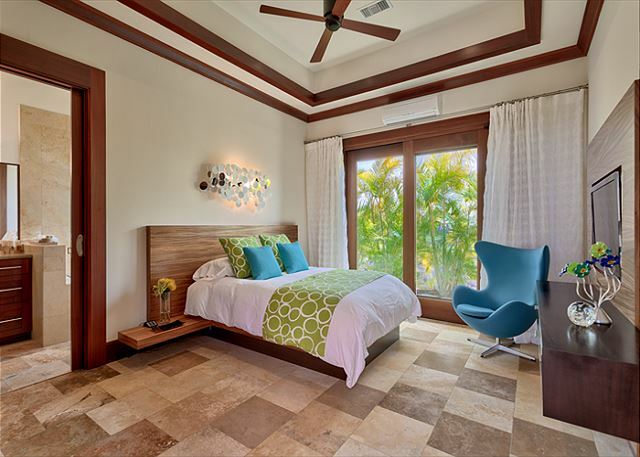 On the other side of the home is the second master bedroom with a king size bed and a wall mounted television. 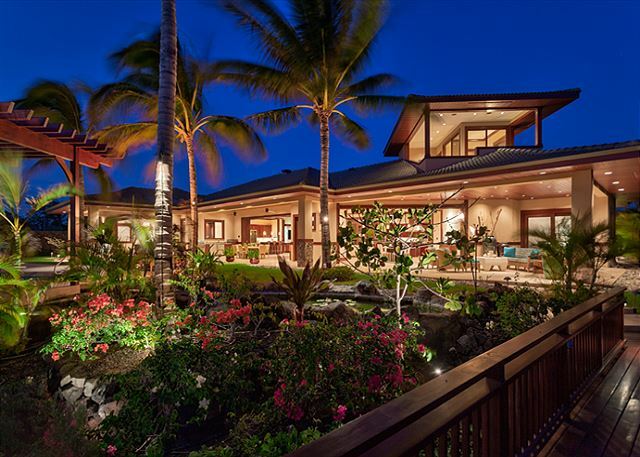 The large pocket doors open to the lanai and the beautiful view. The spacious bathroom has a walk in closet, dual vanities, a walk in shower, and a tub. Just off the main house is a lush courtyard area with access to the two guest bedrooms. 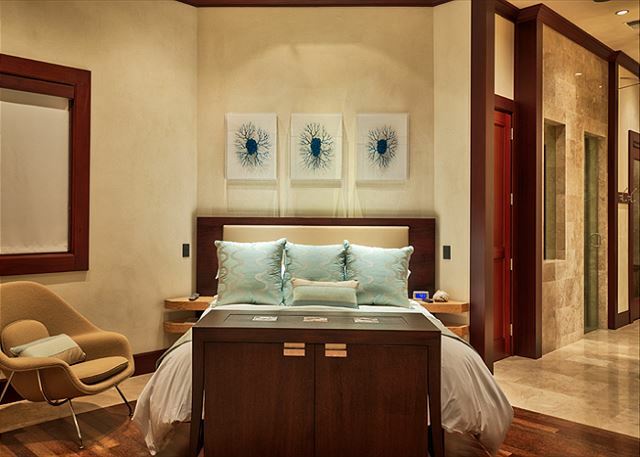 Each guest bedroom has a queen size bed with a wall mounted television. Each private bath has a vanity with a large shower and a deep soaking tub. Other amenities include extended cable on all the televisions, ice makers located throughout the house, Crestron system for easy operation of this “smart home”, wireless internet, an office area with a computer and printer, nice original artwork, and zoned air conditioning. 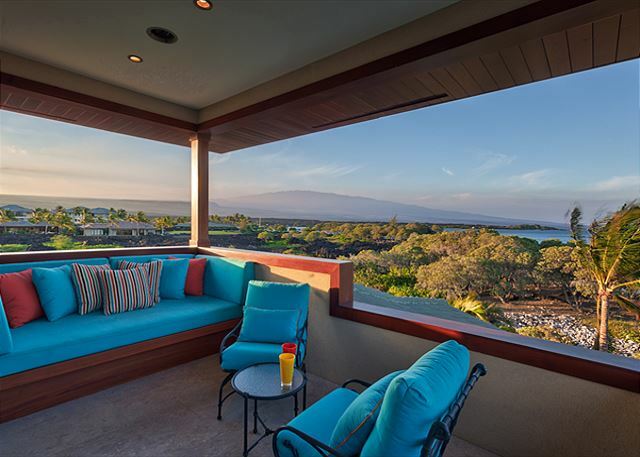 While staying at this home you will enjoy personalized service and access to the amenities of the Hilton Waikoloa Village. 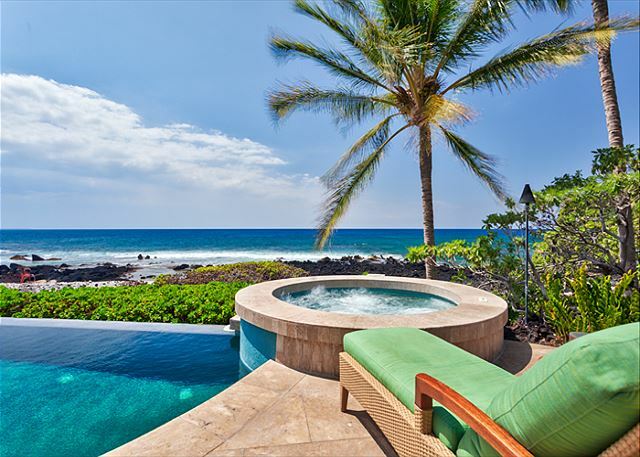 The Waikola Beach Resort is one of the most popular vacation destinations on the Big Island of Hawaii. As it has expanded over the years, it now offers everything you would need to enjoy your vacation directly within the resort. 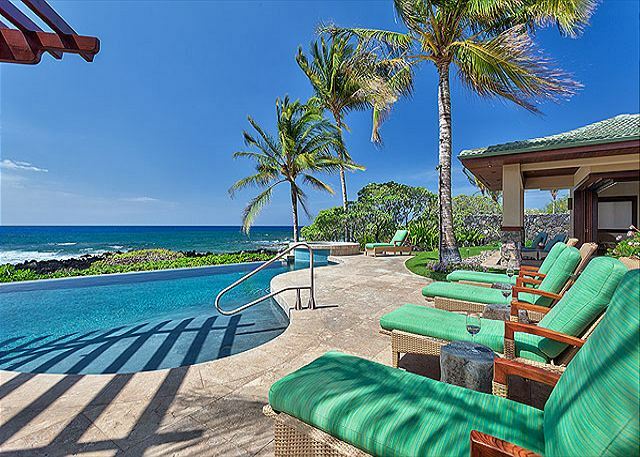 The Waikoloa Brach Resort is home of the two champion golf courses, The Kings and Beach Courses. You will also find a nice mile long white sandy beach, A’Bay, just in front of Kolea. The Waikoloa Beach Resort offers two large open air shopping mall, the Kings Shops and the Queens Shops. At the Queens Shop you will find the grocery store, which is expansive and offers everything you should need during your vacation. Attached to the Queens Shops is the amphitheater, which is home to live performance a few times a year.